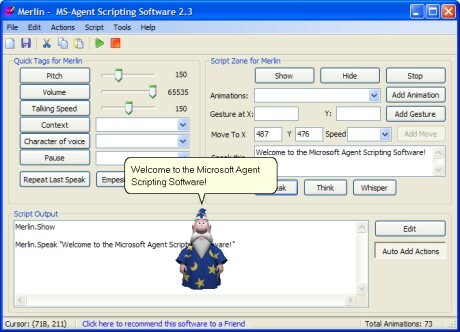 Microsoft Agent Scripting Software (MASS) is an easy to use tool to create MS Agent scripts with animated, speaking characters. You can easily create agent scripts by dragging the character on screen, selecting a few options and clicking buttons. You don't need any scripting experience, even though advanced users have the option to view and manually edit the generated script as well. The program outputs the complete HTML page, ready to upload to your web site. With easy understandable interface any windows user can create scripts, it is a must have software for every windows users interested in the Microsoft Agent Technology. What is MS Agent Technology? Microsoft® Agent is a set of programmable software services that supports the presentation of interactive animated characters within the Microsoft Windows® interface. Developers can use characters as interactive assistants to introduce, guide, entertain, or otherwise enhance their Web pages or applications in addition to the conventional use of windows, menus, and controls. Microsoft Agent enables software developers and Web authors to incorporate a new form of user interaction, known as conversational interfaces, that leverages natural aspects of human social communication. In addition to mouse and keyboard input, Microsoft Agent includes optional support for speech recognition so applications can respond to voice commands. Characters can respond using synthesized speech, recorded audio, or text in a cartoon word balloon. The conversational interface approach facilitated by the Microsoft Agent services does not replace conventional graphical user interface (GUI) design. Instead, character interaction can be easily blended with the conventional interface components such as windows, menus, and controls to extend and enhance your application's interface. Microsoft Agent's programming interfaces make it easy to animate a character to respond to user input. Animated characters appear in their own window, providing maximum flexibility for where they can be displayed on the screen. Microsoft Agent includes an ActiveX® control that makes its services accessible to programming languages that support ActiveX, including Web scripting languages such as Visual Basic® Scripting Edition (VBScript). This means that character interaction can be programmed even from HTML pages using the <OBJECT> tag. To see a demo of Microsoft Agent Technology click the View Demo button. Secure Online Order. Your Information is Safe.